It’s not every day that you get a fighting game where no actual punches, kicks, or fireballs, are thrown. It’s less common that you get a fighting game that purely uses words. But that’s what Oh…Sir! The Insult Simulator surprisingly offers. One on one battles of words that’s part novel, part funny, and part awkward. The goal of Oh…Sir! is simple. Reduce an opponent’s life bar to zero. This is achieved by throwing an array of supposedly cleverly worded insults their way to slowly chip away at their health. The insults are formed by players (whether human vs human or human vs AI) alternately taking words or phrases from an available pool to form the most offensive insult. The “better” the insult, the more damage it does. There are limitations to the insults players can throw. While the combination of words and phrases used for the insult doesn’t necessarily have to make sense or even be remotely funny, the game does make a point of making sure players’ grammar is sound. Picking a word or phrase that’s off-grammar leads to a bit of self-damage while ending up with an incomplete sentence leads to zero damage dealt. Oh…Sir! does offer a few ways to help players form insults or do more damage. Apart from the list of words and phrases the game offers both combatants at the start of the match, each is given two extra words or phrases just for them to use. Two more extra words or phrases can then be randomly generated although the initial one or two (if not used) will be replaced. Players can then do more damage by taking advantage of their opponent’s weakness, performing combos, or potentially do more damage by using the ellipsis. Combos are performed by using the same phrase or word in consecutive rounds for even more damage. The more turns a phrase or word is used consecutively, the more damage the insult does. Players can then use the ellipsis to skip the round but hold their built sentence, giving them the opportunity to add words and phrases from the next round for a potentially giant insult. Each of the game’s characters also has a weakness that, when found out, can be exploited to do more damage. Weaknesses range from clothes and status to family and death. All this combine to give Oh…Sir! a sense of strategy as players will need to not only look through the words or phrases that are available to them, they’ll also need to watch out for what their opponent is attempting to form to either beat them to contested words or phrases or block them from getting the one they need. Things quickly become repetitive though as players quickly find out that the roster of words or phrases in the game is disappointingly anemic. Players will soon find themselves reusing the same set of words or phrases over and over. The lack of content can also be seen in the game’s lack of levels, with only three levels to choose from initially and only a couple more that can be unlocked. The game’s weakness system also acts as a double-edged sword. While weaknesses force players to choose certain phrases or words first so they won’t be used against them, they also make the game predictable and repetitive as it becomes obvious which phrases or words a player should target to either protect themselves or to get more damage against their opponent. The game features a roster of 10 unlockable characters, which surprisingly includes a creepy H.P. Lovecraft. Unlocking characters can be done by completing the game’s Tournament mode. The Tournament mode lets players go through a faux story mode made up of five scenarios against several characters. Apart from the Tournament mode, there is a single-player quick battle mode as well as offline and online multiplayer modes. Playing with friends does help alleviate some of the game’s repetitiveness and makes for some good entertainment, although it still doesn’t last very long. While the concept of Oh…Sir! 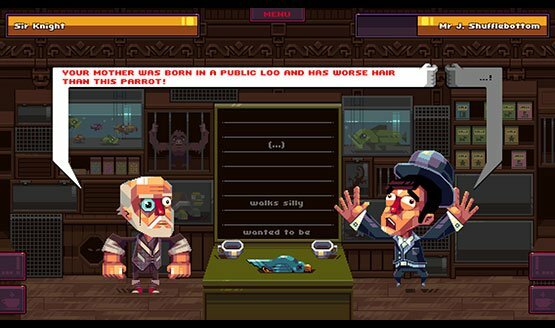 The Insult Simulator is undoubtedly novel, it is disappointingly lacking in its execution. Its charm, which in itself is already given to subjectivity due to differing tastes in comedy, wears off pretty fast and the game soon degrades into a repetitive and predictable slog. And while it’s hard to argue against its $2.99 price tag, a higher price would have been easily welcomed if it meant more content. Simply put, while the game is genuinely fun at first, there’s just not enough of it to go around as it currently stands. Review code for Oh…Sir! The Insult Simulator provided by publisher. Reviewed on PS4. For more information on scoring, please read our Review Policy here.